The advocate of the healthy life should live it by example, and Dr. Andrew Weil does. Using his background of botany and medicine, Weil has established himself as a leader in “well being” through his books and columns. Complementing his latest venture, a restaurant in collaboration with chef Sam Fox, Weil has produced a cookbook – True Food. Cookbooks can be adult picture books, full of enticing pictures of delicious dishes that drip off the pages, with recipes that you may or may never actually try. Weil’s True Food offers ideas for those trying to eat healthier, without sacrificing taste. Although the book leans toward vegan offerings, Fox’s influence is obvious with a few recipes for meat; the last chapter also includes drink mixes, some with vodka and whiskey – and a pomegranate martini. I marked a few appealing recipes: the kale pesto, bison chili, pistachio dream; others to skip – Korean broth, glazed burdock root. The sea buckthorn fruit drinks might be worth tasting – if you can find sea buckthorn – the latest berry with promises of immortality – like acai, before being immersed in sugary drinks and smoothies. Weil’s comfort not only comes through food; his introductions to chapters include quiet and forgiving thoughts on the merits of fresh natural ingredients that can just as easily be whipped into a delicious meal as those with less quality. His comments on added ingredients used to mask staleness or inferiority, reminded me of a commercial I watched recently, proudly proclaiming that the restaurant added pancake batter to their scrambled eggs. His food pyramid has chocolate at the top – no better recommendation for me to keep this book. 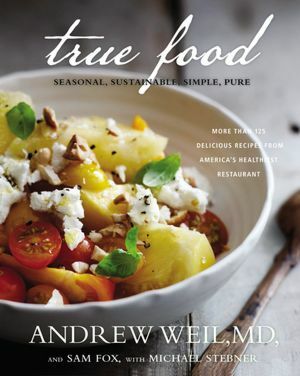 This entry was posted in authors, book review, books, cooking, reading and tagged Andrew Weil, Cook, cookbook, healthy living, healthy recipes, Home, Recipe, Sam Fox, Sea-buckthorn, True Food cookbook, True Food Kitchen, vegan recipes, Weil. Bookmark the permalink. It has been way too long since we have talked. I love Dr. Weil. Drink water, walk, and by all means, have some flowers in your home. What better advice is there. Great to hear from you! I agree. Dr. Weil is my favorite go-to guy for health advice, with Dr. Oz and Deepak Chopra not far behind. I know what you mean – kind of like Santa with good food ideas.